Lemony Aval is another recipe that goes together rather quickly. Fresh or frozen corn kernels, chopped carrots, and/or peas are delicious additions to this dish. Although I prefer lime juice for its wonderful flavor, lemon works just as well. To see information on aval and the types of aval, click here. Place the aval in a bowl and cover with water; pour off the water along with floating pieces of husk, etc. Add 1/4 cup of fresh water. Let soak for about 15 minutes. Prepare thalippu: heat oil in a seasoned kadai (wok) and add the mustard, dals, and dry chili. When the mustard finishes popping and the dals have turned golden pink, add asafoetida and green chili if using and the curry leaves. Stir in the turmeric, soaked aval and salt. Add the cooked vegetables of your choice. Cook covered over low heat until hot. Add lime/lemon juice and mix well. Serve hot, warm, or at room temperature garnished with the nuts. Your favorite chutneys, Indian pickles, and/or a raita make nice accompaniments to Lemony Aval. 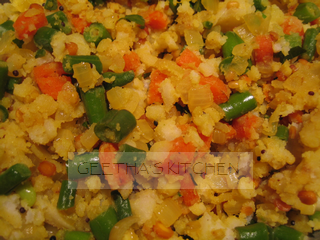 Now that you have leftover package of Aval after making aval upma, you can make Puli Aval. Instead of going through the long process of making the tamarind sauce, we can take a shortcut by using the ready-to-use mix available in Indian markets called "Puliyogare Mix". Just use more or less of the mix according to your taste. This is a lovely dish for a picnic. For information on aval, click here. Place the aval in a bowl and cover with water; pour off the water along with floating pieces of husk, etc. Add 1/2 cup of fresh water. Let soak for about 15-20 minutes. Prepare thalippu: heat oil in a seasoned kadai (wok) and add the mustard, dals, and dry chili. When the mustard finishes popping and the dals have turned golden pink, add asafoetida and the curry leaves. Stir in the soaked aval and puliyogare mix. 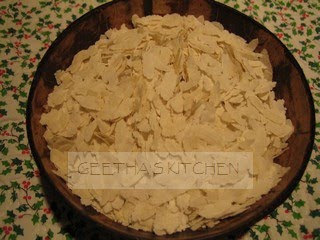 There is already salt in the puliyogare mix so taste test before adding any more salt. Cook covered over low heat until hot stirring once in a while. Taste and add salt if needed. Sprinkle freshly roasted peanuts or cashews on top just before serving. Serve hot, warm, or at room temperature with a chopped tomato salad and papadams. Aval Upma is another emergency dish that goes together rather quickly just like cream of wheat Upma. Aval is the Malayalam/Tamil word for flattened rice flakes (powa or poha in Hindi). It has been eaten in India since antiquity and is the Indian equivalent for oatmeal. It is a good staple to have on hand to make porridge to desserts which cook quickly. When we were growing up, Amma used to make aval soaked in hot milk with a little sugar called Pal Aval for a quick and simple after-school or afternoon snack. And if some raisins, nuts, and/or sliced bananas were added to Pal Aval, we felt we had Manna from Heaven! There are two types of aval/poha - thick and thin. For preparing upma, I prefer the thick kind. The thin kind is good for porridge or payasams (puddings). If you are using "dessicated coconut" (dry and unsweetened) in place of the fresh or frozen coconut, use only half the given amount and reconstitute it with a little water for about five minutes before adding to the upma. Prepare thalippu: heat oil in a seasoned kadai (wok) and add the mustard, dals, and dry chili. When the mustard finishes popping and the dals have turned golden pink, add asafoetida, finely chopped green chili (remove the seeds and membranes to temper the heat) and the curry leaves. Stir in the soaked aval and salt. Cook covered over low heat stirring occasionally until hot. Add coconut and mix well. Serve hot or warm with your favorite chutneys such as the coconut, green chili, red bell pepper, or coriander/mint or any Indian pickles. Enjoy! The sunset colored Bell Pepper Chutney is another of Amma's fantastic contributions to my culinary repertoire. Amma often made it to accompany Dosa, Adai, simple dal, Molakootal, or Molagushyam. Red bell chutney raises the taste quotient of an otherwise simple or bland meal. Roast the whole bell peppers and the onions whole in a 425 F oven until the skins are charred. Cover them until cool, and peel the skins off. Remove the stems and seeds of the pepper and trim the onion. 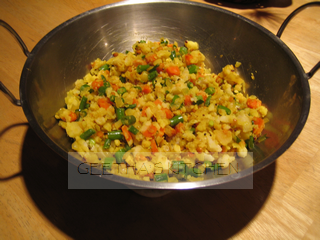 Alternately, the veggies can be chopped and added to the toasted ingredients and cooked until soft. Heat oil in a small skillet and lightly brown the urad dal, coriander, and chilies. Turn off the heat and add the curry leaves and stir. Let cool. Grind the bell peppers, onion and the rest of the ingredients with just enough water (add water a Tbsp at a time) into a smooth puree using a blender. Taste for salt and add more if needed. Set aside or chill until needed. This chutney will last for about a week or so in the refrigerator. Serve with dosa or as a dip or condiment with sandwiches and snacks. Gratin is a wonderful and absolutely delicious make-ahead dish perfect for pot-lucks and parties. 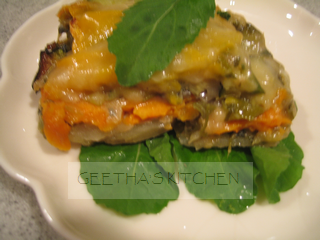 The vegetables are layered like a lasagna with the fragrant leeks and fennel and some cheese strewn between each layer. It is even better reheated the next day; so do make some extra :). I love to make this particular combination of autumn veggies for our Thanksgiving or Holiday dinner. The hot gratin is lovely served over the greens - which wilt and add another dimension to the taste sensation. It can star as a great starter too. Wash all the veggies and drain well. Trim root ends and the dark green tops off the leeks. Cut into halves lengthwise and wash well including between the layers where sand and soil tend to hide. Drain well and slice thinly. Trim off root end and any discolored parts from the fennel bulbs and quarter them; slice thinly. Heat the olive oil in a wide skillet and add the leeks with a pinch of salt. Cook for about 5 minutes stirring often. Add the fennel, garlic, the rest of the salt and lots of freshly ground pepper and cook for about 5 more minutes. Remove from heat and cool; stir in the chopped herbs. While the leek mixture is cooling combine the milk, herb sprigs, whole black pepper, and crushed fennel seeds. Warm the milk until very hot; steep for 10 minutes on low heat. Strain and discard the herbs and season with the salt and nutmeg. Thinly slice the potatoes, zucchini, butternut squash, and the sweet potatoes and keep them separated. Shred the cheeses and combine. Coat a 9 by 13 inch baking pan with cooking spray, oil, or butter. Layer # 1. Place the potato slices in an overlapping layer to cover the bottom of the baking pan. Sprinkle with salt and a generous amount of freshly ground pepper. Sprinkle with a third of the leek-fennel mixture and a quarter of the cheeses. Layer # 2. Repeat layering with sweet potato slices; sprinkle the top with salt and a generous amount of fresh ground pepper. Sprinkle with a third of the leek-fennel mixture and a quarter of the cheeses. Layer # 3. Layer the zucchini slices; sprinkle the top with salt and a generous amount of fresh ground pepper. Sprinkle with the last third of the leek-fennel mixture and a quarter of the cheeses. Layer # 4. Make an overlapping layer of the butternut squash to completely cover. Pour the hot steeped milk over the veggie layers carefully. Cover and bake for 1 hour or until veggies are tender. Sprinkle the last quarter of the cheese on top and bake uncovered for 15 more minutes or until the cheese melts and turns golden. Remove from the oven and let rest for 15 minutes. Sprinkle with chopped fresh herbs. Cut into pieces and lift each piece with a spatula so that each serving includes all the layers intact. Serve hot as is or over the greens. and corn muffins or a crusty bread with your favorite cheeses for a winter celebration. Put soaked and drained chick peas, barley, and a little salt in a large pot and add 2 quarts of water. Bring to a boil, reduce heat and simmer partially covered until tender. Set aside. Prepare the picada: toast the bread; dry roast the almonds. Heat the olive oil in a large pot and cook the garlic cloves until slightly golden; remove and add to the picada ingredients. Save the rest of the oil in the pot to proceed with making the soup. Pulverize the bread, almonds, and the sauteed garlic clove using a blender or mortar and pestle into a fine paste with the vinegar and some broth from the soup. In the rest of the oil in the pot, add onions with a pinch of salt and cook over medium heat stirring until onions are translucent. Stir in paprika and ground red chili; stir and cook for 2 minutes. Add the tomatoes and cook for 5 to 7 minutes. Sir in saffron, chick peas with their cooking liquid, salt to taste and the picada; bring to a boil. Add green beans, squash, boiling water to thin the soup to your desired consistency and simmer for 15 minutes or until the veggies are tender. Turn off heat, stir in chopped cilantro or parsley and season to taste with more salt and freshly ground pepper. Allow to rest for 10 minutes. Serve hot with corn muffins. The simple Beet Salad brightens up winter menus deliciously. It can be made with uncooked carrots and beets also. The crunchy, juicy, and sweet Asian pear or jicama (a Mexican root vegetable usually eaten raw) is great in this salad. Jicama (pronounced hee-ka-ma) tastes a bit like the Asian pear. Steam the beets and carrot lightly until barely tender but still retain their crunch; cool and cut into 1/2" cubes. Cut the onion into small cubes while the beets are cooling. Place them in a colander and pour a cup of boiling water over them; drain well and let cool. Place the onions in a bowl; sprinkle a pinch of salt over them and squeeze the lime/lemon juice. Let marinate for a few minutes. Stir in the cubes of carrots and beets with a little more salt and mix well. Taste; add more lime or salt as needed. Sprinkle the cilantro, jicama, and the pomegranate arils on top and serve or chill until needed. Enjoy!! Here is a recipe for a delightful and rich tasting banana bread made without any eggs or dairy products. I have eliminated not only the eggs, but the butter as well :). No eggs/butter = no cholesterol! This is a tried and true recipe: Chellu loves it! A wonderful use for those overripe bananas which are past their prime and on the way to the compost bin! Also, I like baking in a shallow pan rather than in a loaf pan since it cooks in less than half the time. If you however wish to make a loaf, bake at 350 degrees F for about 60 minutes. 16 pieces; Each piece contains about: 165 Calories; 2.8 g Protein; 24 g Carbohydrates; 7.3 g fat; 2 g Fiber. Coat with oil or cooking spray an 8 by 8 square baking pan. Cream the oil, sugar; then mix in the vanilla, mashed bananas and oatmeal. Combine flour, baking powder, and salt in a bowl. Sift the flour mixture over the banana mixture; mix just enough to combine well. Pour the batter into the prepared pan; sprinkle the walnuts evenly on top of the batter. Bake for 20 to 25 minutes; the bread should have browned around the edges and cooked through. Cool for about 15 minutes before cutting. Serve warm or at room temperature with hot Masala Chai. Corn muffins are so perfect with a piping hot cup of tea, coffee, a bowl of hearty Chili or soup. The soup was ready - yummy leek-potato where broccoli was substituted for the zucchini. I was so set on making corn muffins to go with it, but alas! there was not a sign of either butter or buttermilk in the fridge. Determined not to be stymied by the absence of the dairy duo, I decided to try out some substitutions. And ........ the muffins turned out fantastic! So here is the amended recipe. Soy, rice, or nut milk may be used. I am partial to muffins (rather than bread) as they are wonderfully crusty (no paper liners in the muffin tin), stay fresher longer, and no messy crumbly pieces to deal with either. Preheat oven to 400 degrees F. Coat a muffin pan or 8" square cake pan with oil or cooking spray. Combine cornmeal, flour, sugar, salt and baking powder in a large bowl. Combine the rest of the ingredients in another bowl. Pour the liquid ingredients into the flour mixture and mix just until combined. Spoon the batter into the prepared pan and bake for about 15 minutes or the edges are lightly browned. Remove from oven and cool slightly before serving. Store any leftovers in an airtight container at room temperature for a couple of days and reheat just before serving. Freeze for longer storage. Enjoy!! This multitasking potato curry is great as a side dish with any roti, rice, etc and as a stuffing for dosa, bondas, samosas or sandwiches. It is a delicious way to use up leftover boiled or baked potatoes. Feel free to leave out the other veggies or use more green chilies and chop them finely including the seeds and membranes for a spicier curry. 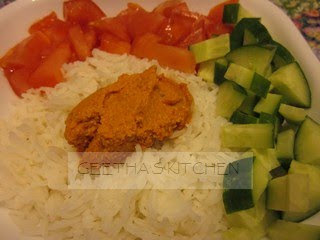 I often take this colorful potato curry to picnics instead of the traditional potato salad. Remove the green chiles before serving or removed seeds and mince for a mild dish. 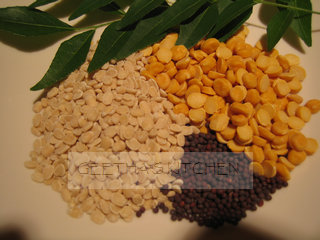 Heat the oil and add the mustard seeds, urad and chana dal. Cook covered until the mustard seeds pop and dals turn golden pink - this takes just a minute or so. Add the asafoetida, onion, green chili, and curry leaves with a pinch of salt and cook until the onion pieces become translucent. Stir in the chopped veggies and/or peas along with the turmeric and salt and sauté until tender. Add potatoes and stir well to mix. Remove from heat and stir in lime/lemon juice and chopped cilantro. Serve hot, warm, or at room temperature. Enjoy!! This is a lovely soup to make anytime at all; the hydrated dried peas are absolutely delicious. I have seen them for sale in super markets but it is just as easy to soak them overnight. If you prefer, hydrated black-eyed peas can be used instead of the whole peas. Other kinds of beans may be used as well but cook them before adding to the soup as they will need more cooking time. Another fine addition is barley (about 1/2 cup); but since it needs a longer cooking time, barley should be cooked separately and added to the soup along with the veggies. Bon Appetit! Heat the olive oil in large, heavy-bottomed stockpot over medium-low heat. Add the leeks, garlic, and a pinch of salt and cook over medium heat until they begin to soften, approximately 5 to 7 minutes. Add the potatoes, hydrated peas, 1 tsp salt, freshly ground pepper, and continue to cook for about 5 more minutes, stirring occasionally. Stir in the stock or water, increase the heat to high, and bring to a good rolling boil. Add the carrots, green beans, tomatoes, and corn kernels; bring to a boil again. Reduce heat so that the soup is just simmering; cover and cook until the vegetables are tender, approximately 30 minutes. Remove from heat and stir in the basil and parsley. Taste and adjust seasonings, with kosher salt and additional freshly ground pepper. Serve hot with corn muffins/bread or other accompaniments. Pass the lime/lemon wedges to squeeze into the soup.